Everything you know about public relations and how the news is produced is fake and can be manipulated for your benefit. Tags: Public relations, marketing, PR, media, growth hacking, writing, trust, credibility, honesty, integrity. You need to get publicity in mainstream media in order to succeed. You want to become a journalist or contributor to publications. You’re a blogger, entrepreneur, or marketer. Too many books start with “I’m an industry insider and I’m going to spill all my secrets…” only to then give you a bunch of information you could easily find online. This is not that kind of book. 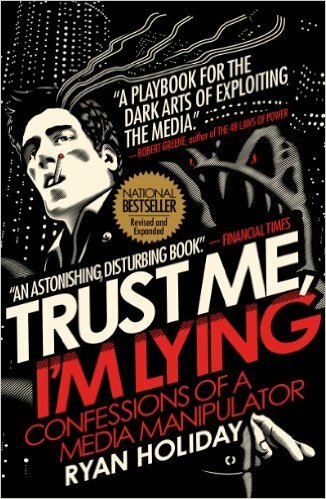 Ryan Holiday’s book is disturbing, especially so for me because as a contributor to Forbes, Mashable, TechCrunch, etc. I’m one of the people he’s “exposing” in his book. If you want a look at how the media operates, this is it. I can tell you so because I’m part of it, and I’ve seen it firsthand. That said, based on the book I feel Holiday has been exposed primarily to the negative side of the media, whereas I’ve had the privilege of seeing mostly its positive side. My experiences don’t invalidate those of Holiday nor vice versa, it’s just a matter of quantity. Everything Holiday says is true, except that the corruption of the industry perhaps is not quite as pervasive as he thinks. Or perhaps it is, and I’m the one with a false view of things. Regardless, the book has great, actionable lessons for any entrepreneur or marketer trying to figure out how to master the media cycle and get into print. It’s also wildly entertaining.